I wonder why they released this now. What the.... Seriously, that's not a trailer. It's more like a bad designed announcement. They are lowering the fans expectations so that they can amaze us with a super duper amazingly MADBROGAME! They had me with "the drums of battle ...". Im so much excited, i cant think straight. Drums, oh man, imaging that! 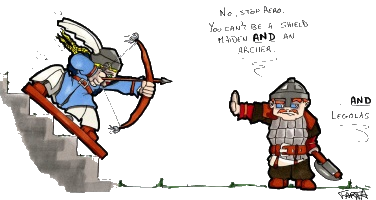 The one and only thing Warband misses. Thats why my secrete favorite always was mount & musket. Drums finally. And the name Bannerlord. So much creativity and such a recognisable name. Damn. Still looking forward to this. That's cool though, new players incoming, maybe that'll expand the community a bit. Besides, if Bannerlord would like a bit nicer than WB, can't say no to that. Let's see how it will be! Wouldn't say that was cool. Warband feels unfinished and unpolished. After playing Warband for 2 years, this game needs to impress me with a lot of improvements to get my attention. If its just another Warband with up to date graphics I'd be disappointed. EDIT: Also, that was one of the worst trailers I've seen. Sorry to all the WotR fanbois :O, but I think this will be a better game than that, for me the M+B series is about gameplay and less about looks, looking forward to this but i don't think it should be called a trailer, it's just an official announcement video. I Hope that's it's exactly like M+B warband but just improved gameplay. WotR may big a 'big thing' but it's focused too much on graphics and last time I played it was far too slow and sluggish and the fps rate was terrible. If the graphics are average but gameplay good I'll be happy, but if they go down the WotR route I won't, I hoped that WotR was going to be a good game but frankly I'm disappointed to put it nicely. Though I agree the name is rubbish. I hope that as in Warband, there'll be early beta stages, and that the developpers will use the forums again as a means of communication to the beta players. Beta really made Warband better, let's hope they do teh same approach for Bannerlord. I didn't have anything against the name Bannerlord until I realized that to distinguish it from Warband I would have to always call it Bannerlord. M&B2 just too long to say. Perhaps maybe just "two." Or "the second."